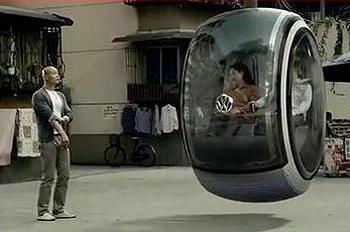 BEIJING, China, June 4, 2012 (ENS) – Volkswagen’s People’s Car Project launched last year has led to creation of a “Hover Car” that floats above the road using electromagnetic levitation. The project allowed Internet users in China to post their ideas about cars of the future. From the more than 119,000 ideas submitted by 33 million visitors to the People’s Car Project website over the past 11 months, the German automaker selected three to develop and build as concept vehicles. The “Hover Car,” the “Music Car” and the “Smart Key” were unveiled last month at the Beijing International Auto Show. The zero-emissions two-seater Hover Car looks like a shiny flying donut as it hovers just above the ground, moving forward or backward, left or right. The Hover Car could in the future travel along electromagnetic road networks. The same method of propulsion is already used by maglev trains in China, Japan, Germany, California and elsewhere. The Hover Car concept was submitted by Wang Jia from Chengdu, Sichuan, China. “The creative ideas from the People’s Car Project give us a valuable insight into the wishes of Chinese drivers,” said Simon Loasby, head of design at Volkswagen Group China. “The trend is towards safe cars that can easily navigate overcrowded roads and have a personal, emotional and exciting design,” he said. The music car expresses the wish of many Chinese for individual automotive design. Equipped with organic light emitting diodes, the exterior color of the vehicle changes with the driver’s choice of music. The car becomes a means of self-expression and a fashion statement for young drivers. The Smart Key, also developed under the People’s Car Project, takes up the trend towards the stronger integration of online technologies in vehicles. This vehicle has a high-resolution touchscreen that keeps the driver up to date on the fuel situation, climate conditions and the car’s security via the 3G network. The driver can monitor the vehicle from a bird’s eye perspective through real-time satellite transmission. “The People’s Car Project in China marks the beginning of a new era in automobile design,” commented Luca de Meo, director of marketing, Volkswagen Group and the Volkswagen passenger cars brand. “We are no longer just building cars for, but also with customers and at the same time initiating a national dialog which gives us a deep insight into the design preferences, needs and requirements of Chinese customers,” de Meo said. Due to high demand and “the exceptionally good quality of the contributions,” Volkswagen says the People’s Car Project, which was originally scheduled to run for one year, has been extended indefinitely. Volkswagen says a new project phase will be launched in the coming months. At that time, users will be able to submit their design, personalization and connectivity ideas for future mobility, and will also be able to contribute suggestions about the environment. First, the drafts will be evaluated by the entire user community. In a second step, experts will assess the concepts and award prizes to the winners. “In a long-term context the findings of the People’s Car Project will influence Volkswagen’s product strategy,” de Meo explained.